Washington D.C. (March 22, 2017) – The global box office showed continued strength in 2016, rising one percent over last year’s record-breaking figures to reach a new high of $38.6 billion, according to the annual Theatrical Market Statistics Report released today by the Motion Picture Association of America (MPAA). In the United States and Canada, the box office hit $11.4 billion, a two percent improvement over 2015. The total number of moviegoers (people who went to at least one movie in the year) also rose by two percentage points to reach 71 percent – or 246 million people. Audiences ages 18 to 24 attended an average of 6.5 movies per capita in 2016, more than any other age group and an increase of 0.6 from the previous year. Per capita attendance also increased among African American and Asian/Other audiences, with these demographic groups attending 0.7 and 1.2 more movies per capita in 2016, respectively. 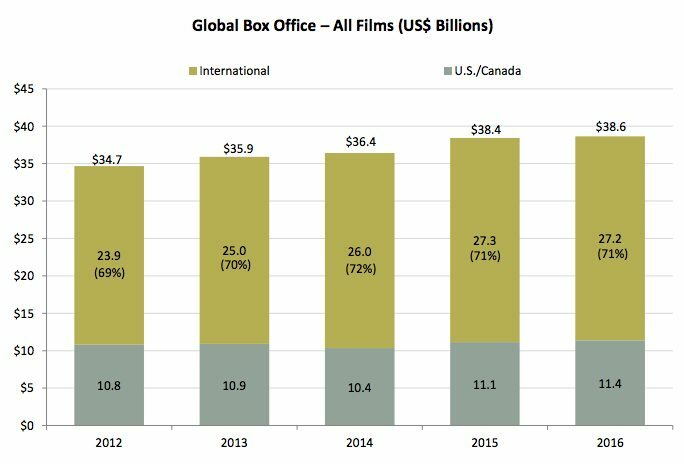 The robust 2016 global box office was accompanied by continued investment in cinema infrastructure. The total number of cinema screens worldwide increased by eight percent in 2016 to nearly 164,000, due in large part to continued double digit growth across the Asia Pacific region. The year in cinema also saw significant technological innovation. Digital screens increased 17 percent, while the number of Premium Large Format (PLF) screens rose 11 percent. PLF screens are one of the most active areas for cinema exhibition, growing in every region of the world with significant potential for greater adoption in the next several years. Tech-savvy audiences are also the people who go to movies in theaters most frequently. In 2016, 79 percent of all frequent moviegoers owned at least four different types of key technology products, compared to 60 percent of the total adult population. “The film industry continues to thrive because every facet of the industry – production, distribution, and exhibition – is relentlessly innovating to bring new stories to life on the big screen,” Dodd continued. For a detailed analysis of the 2016 Theatrical Market Statistics please click here. The Motion Picture Association of America, Inc. (MPAA) serves as the voice and advocate of the American motion picture, home video and television industries from its offices in Los Angeles and Washington, D.C. Its members include: Walt Disney Studios Motion Pictures; Paramount Pictures Corporation; Sony Pictures Entertainment Inc.; Twentieth Century Fox Film Corporation; Universal City Studios LLC; and Warner Bros. Entertainment Inc.